The Missus’ place of employment has transferred her to a new location and changed around her work schedule so you’re stuck with another one of my lame ‘recipes’ while she regroups and adjusts. Woo woo, twice in a week, what lucky readers you are </sarcasm>. One of the things that I’ve always found impressive about my wife’s cooking skills is her ability to take a group of disparate ingredients and turn it into something incredibly tasty. I cannot count the times I looked through the pantry and fridge and announce ‘there’s nothing’, only to have her take over the kitchen and whip up a meal in 15 minutes. Not just edible but delicious too. While I would never claim my skills even begin to approach hers, I do have my moments and lucky for her I had one of those moments this past weekend, so I have material to fill in with while she adapts to her new schedule. some shredded Diaya cheese, about an eighth of a bag of mozzarella & cheddar each. the remains of a couple of bags of pasta. Just making sauce with the pasta wouldn’t have taken advantage of the Diaya so I decided to try riffing on one of my favorites, baked ziti. While under cooking the pasta by 3 minutes, I rough cut the veggies and sausage. After draining the pasta I put it in a heavy duty Le Creuset pot, and mixed in the rest of the ingredients. I lucked out, found a couple of cloves of garlic, crushed them up and stirred them in. I probably added in basil, oregano and some other stuff, I don’t remember exactly, I wasn’t planning on writing about it. You’re all probably more accomplished than I am, so you probably already have your own proprietary red sauce recipe anyway. The finish touch was the Diaya. I mixed it up and spread it over the top of the pasta before covering and baking at 350 degrees for 50 minutes. The result was gooey spicy goodness. The Daiya melted perfectly, oozing down through the pasta/veggie/meatless mix. It wasn’t pretty but it was pretty damn good. 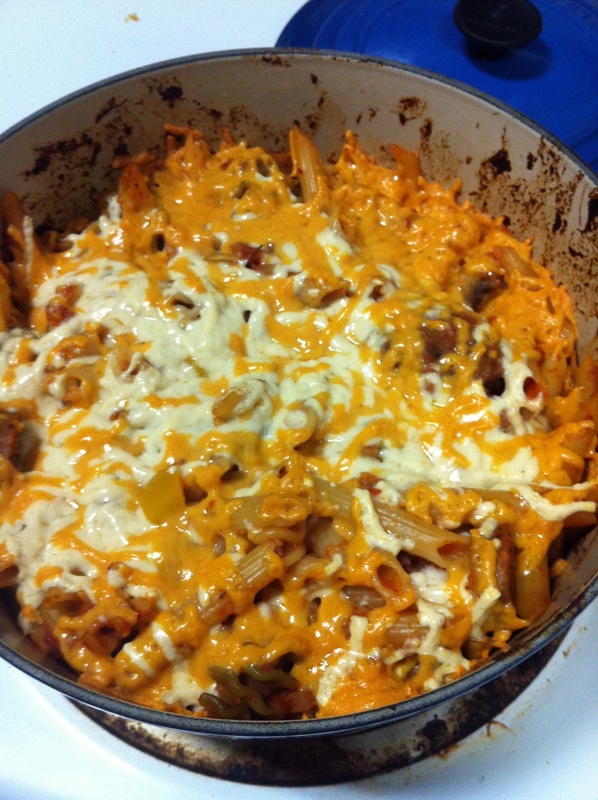 Gallery | This entry was posted in casserole, Felipe's corner, Main Course. Bookmark the permalink.